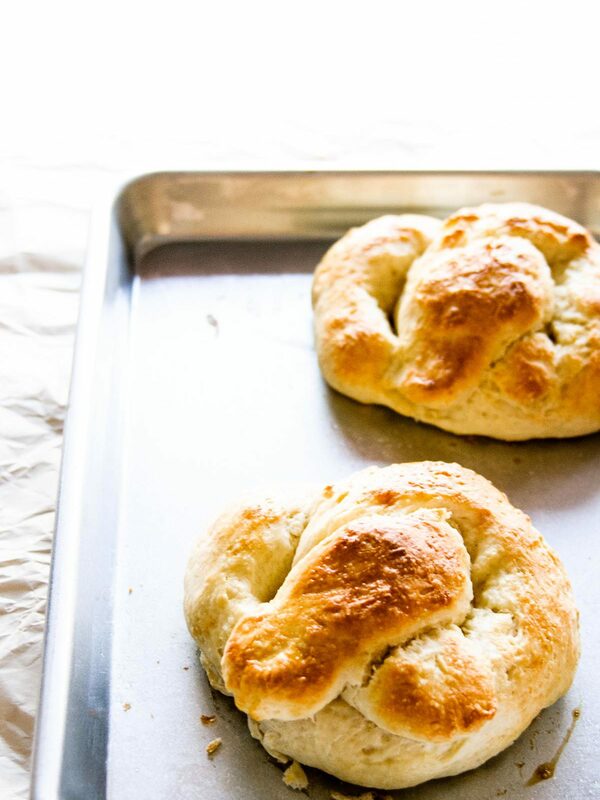 Traditional pretzel recipes require yeast, a dough rise and a baking soda boil all before baking! 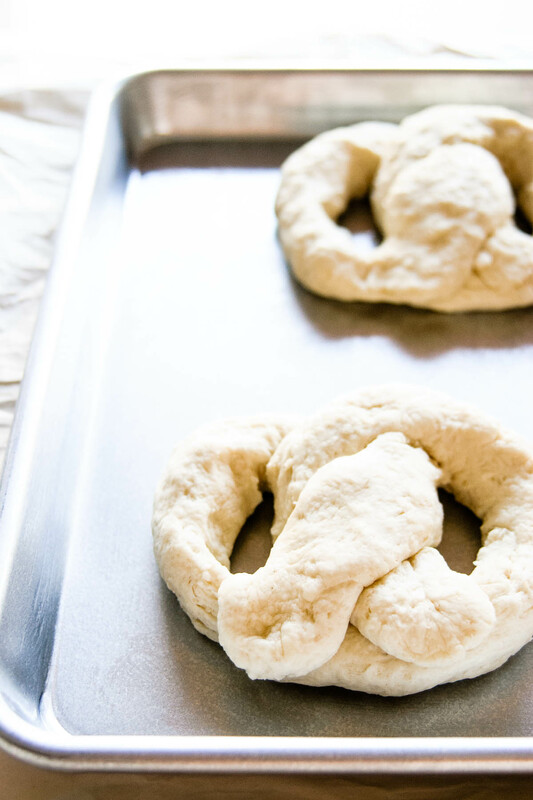 Skip the wait with this Quick & Easy No Yeast Pretzels for Two recipe – your new movie night at home snack that can be made in 30 minutes with little effort and maximum deliciousness! So I’ve been in love with this no yeast (GASP!) 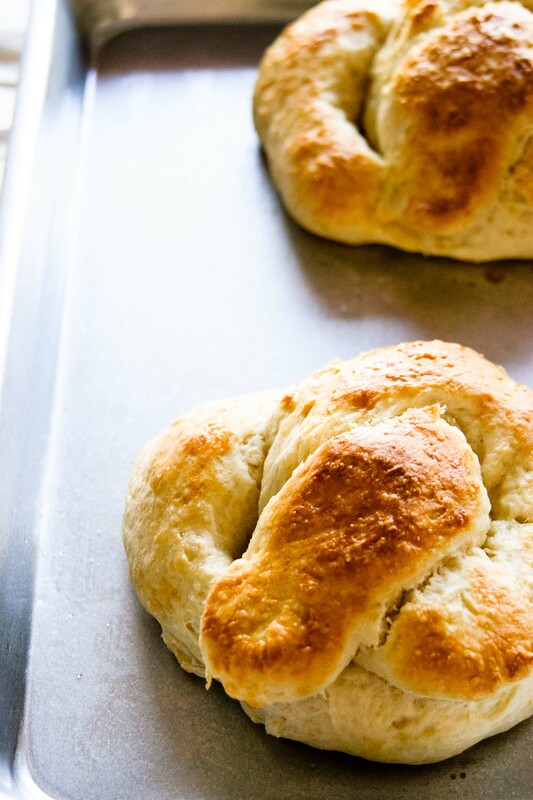 soft pretzel recipe for YEARS! 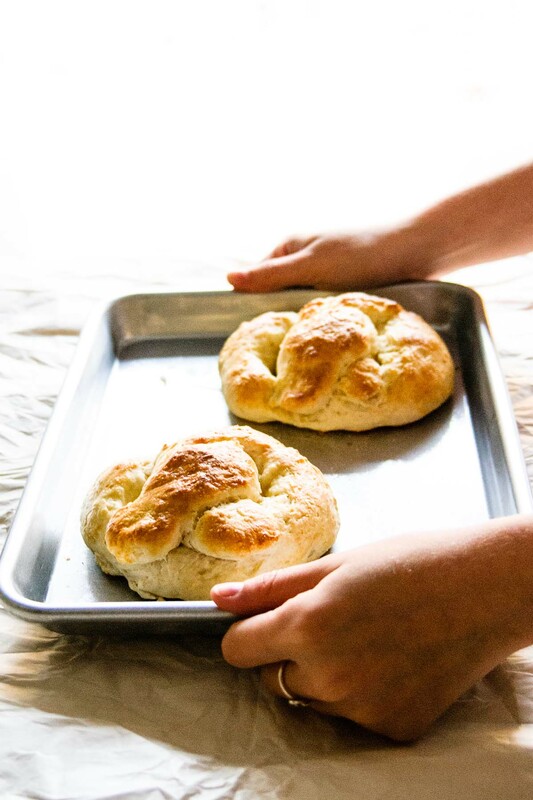 I used to make it at friends houses all the time, and when I would make it at home I’d need to make a double batch – or even more – because by the time they were out of the oven someone had already come by to take one! They are that good! Plus they’re easy, and anything that is easy scores big brownie points with me. 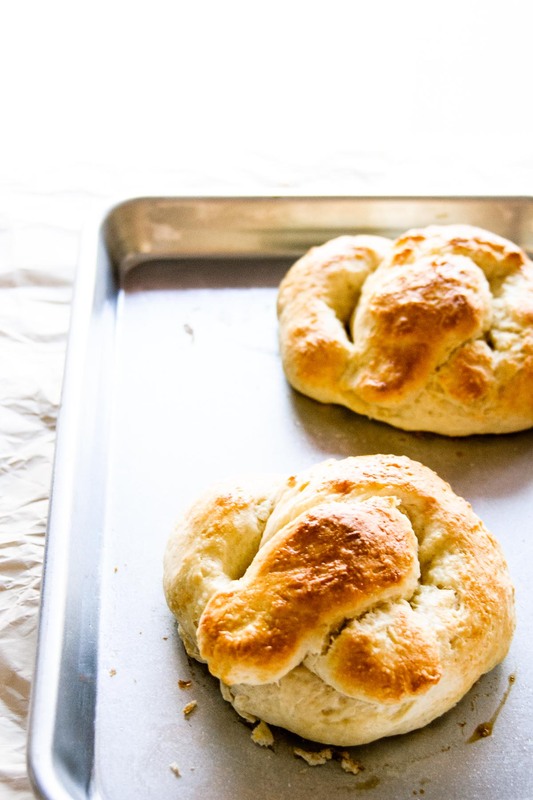 Disclaimer: I do have to say these are not your traditional, wait-till-the-dough-rises-knead-dough-boil-pretzels-in-baking-soda-before-baking, pretzel variety, but they definitely do the trick when you’re craving soft, bready, warm, and a little salty goodness; and I have been craving some after seeing some soft pretzels hanging on food stands in New York City back in August – so of course, I had to make them, and just in time for Oktoberfest! Where did this recipe come from?! To be honest, not a clue. Like I had mentioned in my Kitchen Sink Chinese Stir Fry post, I got the recipe from my home economics teacher in high school – where she got it will forever be a mystery to us all. But this recipe is one of those that you keep, forever, in your back pocket because you can make and adapt them to any format (make a 24, 12, 6, 4, 2 or if you’re ambitious 1 large pretzel, just cook them longer or shorter) and also coat them with whatever you like: cinnamon sugar instead of salt comes to mind here. To be honest, I’ve made these so much that I should remember the recipe by heart – however I don’t, and my mom usually gets a text or phone call asking her to go take a picture of my recipe out of my recipe binder; a binder full of printouts, scribbles and magazine clippings. So I’m being a little selfish and self-serving in this post because once it is on the web I can access this recipe anytime and anywhere – the added plus is that you can too! Tips and tricks for the recipe: none or maybe don’t knead the dough too much because you don’t want to melt the butter with your hands (but more kneading means more work, and why do more when you really don’t have to?!). And another, although not a trick more of a tip, these are SUPER DUPER enjoyed warm. So mix the dough together and pop them in the oven just before starting your movie night – and maybe make a double batch if it’s a long one. PS. Contemplating doing a third recipe post this week for email subscribers! To make sure you never miss a recipe, sign up to The Beader Chef Mailing List! 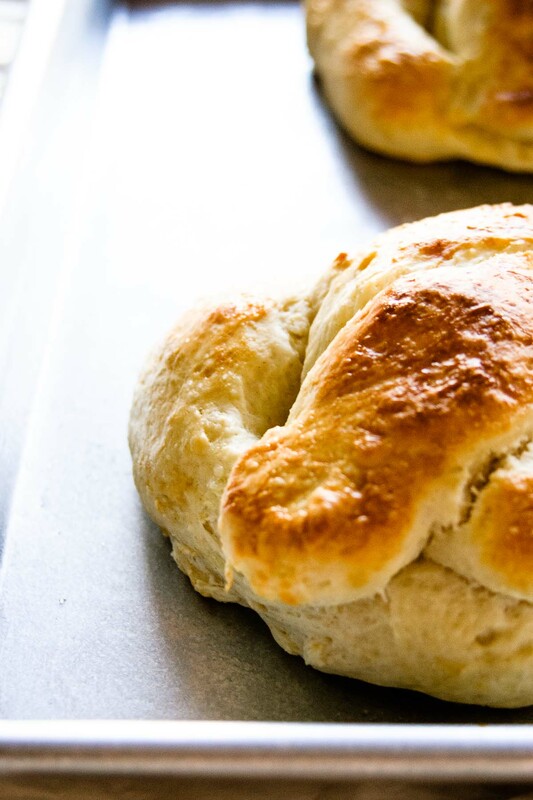 Traditional pretzel recipes require yeast, a dough rise and a baking soda boil all before baking! Skip the wait with this Quick & Easy No Yeast Pretzels for Two recipe - your new movie night at home snack that can be made in 30 minutes with little effort and maximum deliciousness! Preheat oven to 400F and grease a baking sheet with oil. In a large bowl, mix flour, baking powder, salt and sugar until well combined. Add butter and cut into the flour with a fork to get pea-sized pieces of butter. Add milk and stir until sticky dough forms. Next, dump the dough onto a floured board or counter top and knead until well combined, about 5 to 10 times. Make sure not to over knead the dough or the butter will melt. Form a ball and divide in half. Roll out one-half into a long tube and form a pretzel shape; place on prepared baking sheet. Do the same with the other half. Brush the pretzels with the beaten egg and sprinkle with coarse salt. Bake for 20 minutes. Once cooked, let sit for 5 to 10 minutes before serving. These pretzels are amazing right out of the oven, I HIGHLY suggest eating them a couple minutes after they come out - just so much deliciousness!